Torrential rains in Sierra Leone have caused heavy flooding and extensive damage to homes and property, Sept. 17, 2015. Torrential rains in Sierra Leone have caused heavy flooding and extensive damage to homes and property in the capital, Freetown. Telephone communication has been disrupted. The government has asked all citizens to stay at home Thursday except for essential workers and students who are taking the West Africa examination. President Ernest Bai Koroma has held a security meeting to discuss the government’s response to the crisis. 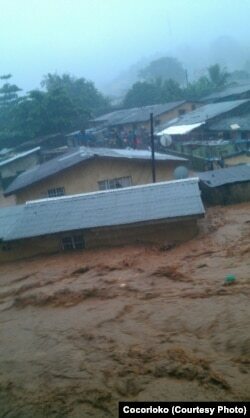 VOA reporter Kelvin Lewis in Freetown said the flooding is the worst he’s ever seen. “It’s very, very bad. I have not seen this in all my life and I have lived in this town for all my life and I’m not a young man anymore. It’s so bad that cars and houses have been swept away. In some cases people have had to access the roof to get out of flooding houses. It’s so massive everywhere in the city; lots of people have been displaced,” he said. Heavy flooding swept through Freetown, Sept. 17, 2015. Lewis said there are conflicting accounts in terms of the number of fatalities. “The government has confirmed that four people have died but other sources have told me that there are seven people, and it is likely that more people could have died,” Lewis said. He said human error may have contributed to the extent of the destruction associated with the flooding. “I think the devastation to homes has been caused by human error because people have been building houses in places they are not supposed to build houses. They’ve been closing up the waterways, and of course, the water when it comes in large quantity like it has been in the past days it's obviously going to try to find a way to pass through so it has been clearing those houses in its path,” Lewis said. Lewis said that Sierra Leone has been identified as one of a number of West African countries that will receive heavy monsoon rains in the coming days. “The government issued a press release saying that the president has convened an emergency meeting with the security forces and the president has already ordered the military and the police out into the streets to be able to help people. The government has also asked everybody to stay at home tomorrow except some kids who are taking their exams,” Lewis said. Lewis said the government has also opened up two stadia to accommodate those displaced by the flooding.